Sitting atop most Australians’ bucket list, the Kimberley is a true once-in-a-lifetime experience. Gazing through my porthole window is like looking at a framed photograph. It’s 5am, and I’ve been gently woken by the warm, dawn light reflecting off enormous, red cliffs on the other side of the glass. Islands rise from the flat ocean, their craggy surfaces throwing shadows that hint at the passage of time they’ve silently observed. An estimated 1.8 billion years have sculpted these imperfect sandstone forms, though you could almost believe they have been created by the hands of giants. For once, I’m grateful to be up at this hour. Incredible Middle Osborn Island, located off the coast of the Kimberley region in Western Australia. Australia’s remarkable Kimberley Coast is one of the world’s last true wilderness areas, and unlike anywhere else on the planet. No matter how many times you edge the vast continent’s northern crust and its thousands of confetti-like islands, the wonder emanating from its ancient, sunbaked environment persists. It’s a place that is at once raw, powerful and energizing, and yet also calming. Somehow, its remoteness and scale doesn’t intimidate, it invigorates. There’s soul-stirring beauty in the harsh, yet soft ocher landforms, lapped as they are by water that ranges from cornflower blue to silky navy. The largest tropical tides in the world sweep in and out each day, creating constant movement, but there are still flickers that catch the eye: the flipper slap of a whale, the ripples of a flying fish or the gasping head of a sea turtle. Maybe even the noiseless mudslide of a crocodile. 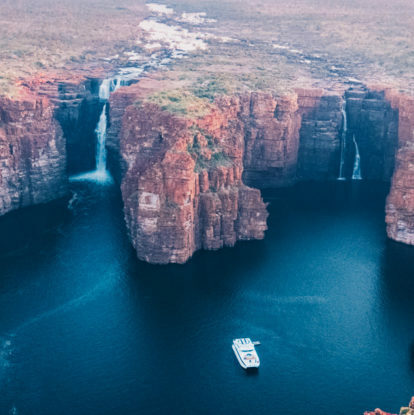 Visiting the Kimberley on a cruise expedition is easily one of the most desired travel experiences in Australia, if not the number-one pick. Traditionally, these barely chartered waters have been explored by longer cruises covering the 1000 nautical miles between the Western Australia outposts of Broome and Wyndham. But a new trend for snapshot cruising is emerging, still taking in many of the key sites, while making this far-flung destination more accessible. Kimberley cruising is typified by small vessels – anywhere from 12 to 200 people board the boats that offer a range of five-star interpretations, from the barefoot luxury of communal breakfasts and beachside bonfires, to the more upmarket style of pre-dinner deck drinks and canapés. While standards are high across the board – think air-conditioned en suite cabins, high staff-to-guest ratios, laundry service and culinary flair – the rugged setting dictates a refreshing lack of formality. Perhaps the most remarkable thing about the Kimberley is the absence of human touch. There are no buildings, no development and no trash. Mental pollution evaporates too; removed from everyday life, we use our smartphones only for taking photos, soaking up the peace this rare occasion brings. And while most cruise ships cover similar itineraries, seeing another is a rarity, allowing you to feel like the entire region, if not the world, is all yours. The Kimberley is home to one of the highest concentrations of islands in the world. Cruising past the red rocks of Cape Leveque, islands are scattered across the Buccaneer and Bonaparte Archipelagos as thick as the Milky Way. Some harbor galleries of rock art, painted by Indigenous hands tens of thousands of years ago. Others are edged with beaches so white you feel grateful for the invention of sunglasses. Bigge Island has both. Padding up the sand to take shade in a karst system, I meet a giant wandjina spirit, its painted white form and saucer-like eyes staring back at me. Another island hides contorted rock formations, the so-called stone warriors on Langgi Beach that reach more than 26 feet tall. A sense of sacredness is palpable as I run my hands over the time-sculpted folds and holes of their surface. The water flow is strong at Horizontal Falls. If anyone on the boat is yet to appreciate the power of the Kimberley’s tidal system, our visit to the Horizontal Falls removes any doubt. The water flow carries such force, it creates flat cascades that froth through gaps in parallel sandstone ranges. The ranges have been gradually eroded as colossal amounts of water push through in one direction, and then turn to retreat. Bumping through the narrow gaps in a jet boat, we’re jerked about as the hull hits boils and whirlpools, the thrill akin to a theme park ride – only this is nature. The folded rock formations surrounding the falls are just as astounding. Unfathomable natural forces have warped the geology, with sedimentary strata tilted sideways by as much as 85 degrees. Rock folds occurred some one billion years ago, with faded orange formations crumpled, bent and twisted like cardboard. There are advantages to cruising at the start of the season, in the humid climes of March and April. In the months prior, during the wet season, most of the region’s 55 inches of annual rainfall soaks the land. As the water culminates in streams and rivers, it peels off cliff edges, creating dramatic waterfalls and plumes of vapor. The Mitchell Falls are one of the most breathtaking examples. We chopper over the Mitchell River National Park, pools of water glinting like mirrors as we cross the verdant landscape. It’s a hike to the lookout, but the sight of the four-tiered falls is well worth it. The first thing that strikes me about this enormous, mesa-like reef is the sound. We’re zooming through a channel as the fleeing tide draws tons of bubbling water away, the white noise drowning out the motor. Slowly, terraced edges emerge, making Australia’s largest inshore reef look as though it’s rising from the ocean. The churning never stops: as soon as the tide is out, it starts coming back in again, gradually hiding the reef from view. It’s a waterfall like no other. Montgomery Reed covers an immense area of about 154 square miles. Green sea turtles love the reef’s seaweed; we spot dozens in the glass-clear water. The journey to these twin cascades is as astounding as the destination. Over millennia, a once great waterway has cut a serpentine route through rock curtains that rise higher with every curve. They act as a rusty red frame to the 260-foot-tall King George’s falls that flow down like Rapunzel’s hair. As we approach, we see the rock behind has been stained black, further offsetting the white fizz. Soon, water droplets prick my skin, and as the vessel nudges ever closer, I stretch out my arms to embrace it. In no time I’m wet to the skin – as we all are, grinning like fools and screeching like children. Go Horizontal’s tour of the Kimberley Coast isn’t a cruise, but it’s the next best thing – and affordable to boot. Departing Broome, a one-hour scenic flight crosses the ocher landscape before the coast gives way to islands; you land on one. From there, a jet boat coasts along turquoise waters into the rusty red Buccaneer Archipelago, heading either for the frothing Horizontal Falls and exhilarating white water rides, or sugar-white Silica Beach and sand lazing. Broome is also the launch point for those interested in a return day trip to Cape Leveque, where the red rocks of the outback meet the sea. The morning flight is followed by a day of cruising the Buccaneer Archipelago, with grilled barramundi for lunch and – for the brave – even cage swimming in waters frequented by sharks and crocodiles. You can also customize your tour, adding a night’s stay at Kooljaman, the wilderness camp owned by the Indigenous Bardi Jawi communities. A four-day Taste of the Kimberley cruise allows you maximum coastal viewing in minimum time. Departing close to the sights at Cygnet Bay Pearl Farm, a six-hour drive from Broome, the small luxury catamaran takes in the Horizontal Falls, Montgomery Reef and the islands of the Buccaneer Archipelago, with spots of fishing, gorge swimming, whirlpool watching and croc spotting slotted in for good measure. Another boutique, luxury vessel, The Great Escape offers a five-day cruise. Despite being named the Kimberley Fishing Extravaganza, its focus goes well beyond just throwing in a line. It also includes gorges, waterfalls, helicopter jaunts and rock art viewing. With more time up your sleeve, join an extended trip with The Great Escape. Its 85-foot catamaran caters to just 14 guests and carries a helicopter. This company runs a similar vessel, taking up to 18 travelers and a jet boat along for extra thrills. This cruising option maxes out at 12 guests. The pinnacle in five star, Australian-run cruise boats, True North hosts a total of 36 people and is also chopper-equipped. All have on-deck spas, internet access and most carry a nature specialist. Catering for up to 116 passengers, with butler services, lounges, a pool and poolside grill, sun deck, two gyms and a beauty center. The company takes up to 114 guests, its vessel equipped with spacious suites, restaurants, bars, a library, gym, and a hairdresser. Book a spot on one of three cruise ships, accommodating up to 44, 72 or 120 travelers with all the bells and whistles you could hope to see. A Ponant cruise holds up to 184 guests who can enjoy a range of restaurants, a theater, lounge, pool and onboard naturalists. The Kimberley cruise season runs March to October. Pick a time based on what appeals most: waterfalls are most dramatic from March to May; climate is most livable from June to August; whales are most visible from June to late September; and fishing is best in September and October. Most cruises start and finish in Broome or Wyndham (via Kununurra), but Derby and Darwin are also launch ports for some itineraries. Broome is the simplest and most popular departure hub, with major Australian airlines (Qantas and Virgin Australia) servicing its international airport; it takes just under seven hours from Sydney (via Melbourne), 4.5 hours from Melbourne and 2.5 hours from Perth. There are direct flights to Darwin from Sydney, Melbourne, Brisbane, Perth, and Adelaide; from Melbourne it takes about 4.5 hours, Perth takes 3.5 hours and Sydney takes 4.5 hours. Cruise companies will pick you up from your accommodation transferring you to the port, or for points closer to the sights, transfer is either by scenic flight or bus. In Broome the Cable Beach Club Resort and Spa is the closest accommodation to the sand, its manicured, sculpture-speckled grounds leading to its Sunset Bar and Grill the perfect spot for watching camel chains return from their evening beach strolls. The Billi sits back from the ocean, but its poolside safari tents and single-floor apartments create a resort feel. Meanwhile, Kimberley Sands Resort and Spa, also a walk from the sea, has luxury, adults-only villas framed around a multi-zone pool. For accommodation options in Darwin see our ultimate Darwin guide. Broome is a characterful outback town facing the Indian Ocean and its 13-mile beach. It has a rich pearling history – the resulting migration transforming it into a multicultural oasis of welcoming people and diverse cultures and traditions. There’s plenty to justify a stop-over: browse pearl boutiques, spot Australian snubfin dolphins on a cruise in Roebuck Bay, take a hovercraft to see fossilized dinosaur footprints, walk through town on an Indigenous tour, and join one of Broome’s iconic camel treks along Cable Beach. Head to the outback town of Kununurra (the flight from Broome takes just over an hour) to see the other side of the Kimberley’s rugged appeal. Deep in the Kimberley’s outback landscape, towering rock formations, reaching nearly 1000 feet, sprout from the Earth. You’ll experience enormous rock domes during your visit to the Bungle Bungles. Known as the Bungle Bungles, the sandstone range is estimated to be 360 million years old, carved into round-topped formations over a period of 20 million years. Europeans have known about the striking geology for a relative blink of the eye – they were ‘discovered’ by non-Indigenous Australians in 1983. Rock art hides within their curves, indicating that people have visited the curious landscape for tens of thousands of years. The best way to drink in this vast patch of mottled ocher rock – some of it striped in black and red, resembling beehives – is from the air. Light aircraft and helicopters depart from Kununurra, soaring over gorges, rivers and hills before coasting over the ancient domes and landing within the nearby UNESCO World Heritage-listed Purnululu National Park. Once inside, a guide will walk you through the Bungle Bungles, allowing you to see and feel their textured forms, their weathered colors and sense their imposing scale. While listening for some of the 130 different bird species in the park, the hike will explore Cathedral Gorge, a cavern-like formation into which, at certain times, a waterfall spills, creating a small pool in the sand. You may also trek into Echidna Chasm, where the rounded rock walls lean in until you can touch both sides. If you want a genuine Aussie experience, then a stay at El Questro is a must-do. You’re sure to experience authentic Australian character at Cockburn Ranges. The staff there are outback people, which means they’re equipped with a cheeky sense of humor, a can-do attitude and an enviable ease of just being themselves. Get in the mood by watching the boab trees out the window on the hosted drive there; your driver will pass the mesa-like Cockburn Range before revving the 4WD through a stream and pulling into the wilderness retreat’s expansive grounds. Stay in the elegant, colonial-feel Homestead (home to just 18 guests) or its modern, cliff-side retreats. Each overlooks Chamberlain Gorge, a waterway hemmed by sheer, ocher cliffs that glow at sunset. Guided gorge walks and excursions focusing on the property’s beguiling nature are all part of the experience, as is an exclusive afternoon soak in the Zebedee thermal springs, naturally heated pools rimmed by an ancient species of palm. High-end meals are included in the price of your stay. Imagine Sydney Harbour, then multiply it by 18. That’s how much water fits in Lake Argyle, at full supply. The enormous expanse of fresh water is a result of man-engineered inundation, carried out in the 1970s to secure irrigation supplies for the region’s agricultural crops. Visiting the impressive dam wall is one thing, but perhaps more engaging is the sight of the lake. Rugged, rusty red ranges and mountain peaks have been transformed into 70 islands, while the water is spirit-level flat. Thirty thousand fresh water crocodiles call the aquatic environment home. Found 46 miles south of Kununurra, the best way to experience it is to join a three-hour river cruise as it wends its way there, including refreshments. Then spend a couple of nights in a self-contained lake-view villa at Lake Argyle Resort and Caravan Park. The resort’s dreamy infinity pool, which enjoys the same outlook, is the subject of thousands of photographs. The Kimberley: crocodiles, sea turtles, whales – receive A$100 onboard credit per person with Coral Expeditions. Explore Australia’s ancient Kimberley region with Coral Expeditions and receive AUD$100 onboard credit per guest. You’re invited to celebrate the debut of InterContinental Hayman Island Resort on the 1st July with 25% off your stay for a very limited time. Conditions Apply.